When it comes to floors, there is a myriad of options to choose from. However, homeowners still prefer tiles because they look more attractive as compared to hardwood floors. Besides this, tile floors are waterproof, easy to install, and are durable. Not only this, their maintenance costs are also lower than that of carpets. But what about the microbes that are living in those tiles? You want to make sure your tile floors are free from any bacteria. Also, they should look new for years to come. That’s why you should adapt the best way to clean tile floors. If you want to keep your floor tiles sparkling clean, it’s important to find out the best way to clean tile floors. Is it worth your time to spend hours scrubbing away those stubborn stains from your floor tiles? Instead of putting your energy into this, it’s always better to clean the floors regularly. Take a soft dust mop and sweep your floor daily with it. This will help you remove dirt and dust from accumulating into the tiles. To avoid your tiles from getting any scratches, remember not to use straw brooms. Use warm water to mop the floor. For best results, do this once a week. Once you’ve cleaned the floor with damp mopping, immediately dry the floor. This way, you’ll be able to avoid new dirt from sticking to the wet floor. No matter how regularly a floor is mopped, sometimes it still looks dirty. This happens if your tiles often get dirty because of stains and greasy residues. If your tile floor is having a similar situation, then it’s time to treat your floor with a deep-cleaning solution. Want to know which of the deep-cleaning methods is the best way to clean tile floors? Try all these on your tile floors and decide yourself! Got hard grease that’s too stubborn to leave your tiles? No worries! Your dish detergent will do the trick. Mix the detergent in water, mop the tiles, and say good-bye to the grease. Mix ½ cup of white vinegar into 1 gallon of warm water. Mop your floor with this cleaning solution. As you clean the floors, you’ll notice how smoothly the grease is removed from the floor. Since the vinegar has acidic properties, it naturally eliminates grease from the floor. It’s natural how kids spill milk, chocolate drinks, and even their favorite paints on the floor. Though you may take such spills for granted, the stains can ruin your tiles in future. Why consume your precious time in removing those hard-to-deal-with stains when you can spot clean them? As the best way to clean tile floors instantly, you’ll just require a mixture of warm water and scouring powder. Spread this mixture onto the stain. Wait for five to ten minutes. Now, scrub the affected tile with a brush. Thoroughly clean the tile with a damp cloth. In case of a tougher stain, you can also repeat this process. But once the stain is removed on spot, you’ll not have to even think about it in future. Forgot to spot clean and the stain is hard to remove? You still have an option! There are different companies that offer their cleaning services to households. You can contact one of them. What makes a tile look shiny? And there’s a reason for that. The dirt accumulated within the grout doesn’t only look disgusting, it creates a negative impression of the homeowner too. 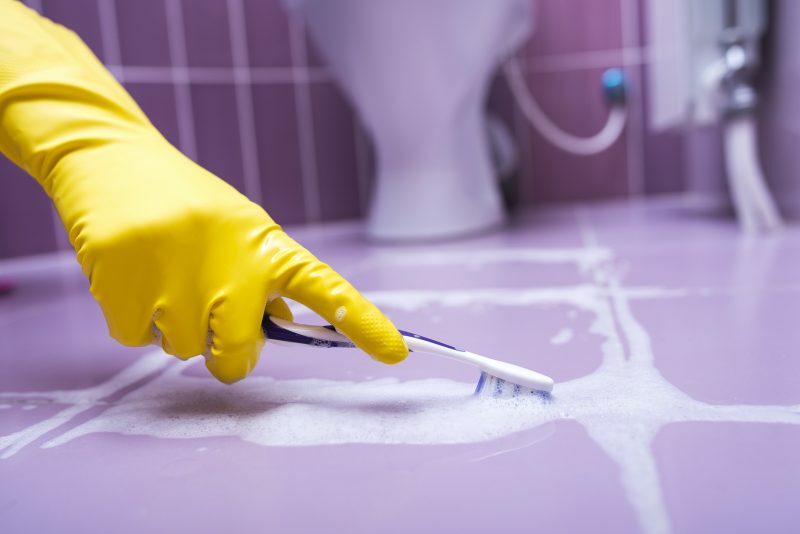 Your guests may notice the dirty grout right from your entrance door. Why take the risk to delay cleaning the grout if you want your tile floor to look clean and beautiful? You’ll need only two ingredients: water and baking soda. If the grout doesn’t look as bright as you expected, you can use oxygen bleach by adding a bit of water to its bleach powder. Use it the same way as you’d use the mixture of water and baking soda. Once the dirt within the grout looks softened, rinse it with water. This is the best way to clean tile floors with oxygen bleach. This way, you’ll easily remove the residue. Though natural cleaning solutions are good to go, what if the dirt in the grout is too stubborn to come out even from bleach? Secondly, since cleaning your gout can be a time-consuming task, you may feel like leaving gout just as it is. But there’s still a solution. This is when you’ll need to consult professional floor cleaning services. Since such companies specialize in floor cleaning, you can trust their credibility too. That’s because they use non-abrasive, heavy duty steam. The extremely high pressure blasts away all dirt, grease, and grime from the grout easily. Before hiring a tile cleaning service, you should inform them about the type of your floor tiles. This way, they’ll prepare the cleaning solution that’s best for your tile floors. Just like prevention plays a crucial role in different things, it can do wonders in keeping your tiles look beautiful. Prevent your tile floors from getting excessive dirt and mud. You can do this by placing mats outside every door of your house. Also, take your shoes off when entering the home. Your tile floors reflect your cleaning lifestyle. If they’re shiny enough to impress your guests, they reveal all good things about you! If they’re dirty, they create a negative impression that could be hard to change. Luckily, it’s easy to clean your floor with a myriad of options. How do you clean your tile floors? We’d love to know your comments! Luckily, it’s easy to clean your floor with a myriad of options. How do you clean your tile floors? We’d love to know your comments!